The culminations of my work designing a menu and making a meal: the reaction from the family. Rather insultingly the first words were, "wow, you made this?" but they soon became more positice from there. My mother especially like her sandwich vowing to try it again despite her initial surprise that a recipe suggested grilling eggplant and the shock that cooking for my first time, I had succeded without a single slice stuck to the grill. My dad was positive (although that might have been because we generally don't eat meat) adn had only good things to say, and my brother remained silent, because he didn't like being photographed. 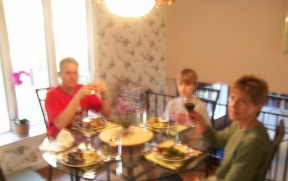 My primary goal for the meal was to create a traditional, family dinner atmosphere. This wan't that hard however, because we eat dinner together every day, 365 days a year. Therefore we already furfill one of Pollans guidelines and the conversation I sparked when I mentioned my goal with the meal and the menu made me think about Pollan's opinions, and those of my family members.